Liverpool produced the best spell of football the Premier League has seen this season, and recorded a crushing victory over the (former) league leaders. Brendan Rodgers named an unchanged side, despite the option of fit-again Joe Allen. He’s still without four key defenders. Arsene Wenger brought Jack Wilshere into the side, moving Alex Oxlade-Chamberlain out to the right flank. Nacho Monreal continued at left-back. This was such a convincing victory, and the game was won so quickly, that it almost defies analysis. Liverpool established their lead from two set-pieces but continually opened up Arsenal in open play, and were always ready to pounce on the counter-attack. Liverpool’s first two goals were scored from set-pieces, a result of poor Arsenal marking, and Steven Gerrard’s excellent set-piece delivery. In this sense, there was a similarity to Liverpool’s recent win over Everton at Anfield, where Gerrard himself nodded home the opener to put Liverpool in command. By going 2-0 up from two dead ball situations, Liverpool had essentially earned the chance to play on the counter, and while it isn’t the most attractive thing about this performance, it’s worth underlining the importance of those set-pieces to break the deadlock. In fact, Liverpool have scored 17 set-piece goals in the Premier League this season, three more than any other side (and, by way of comparison with their opponents here) 12 more than Arsenal. 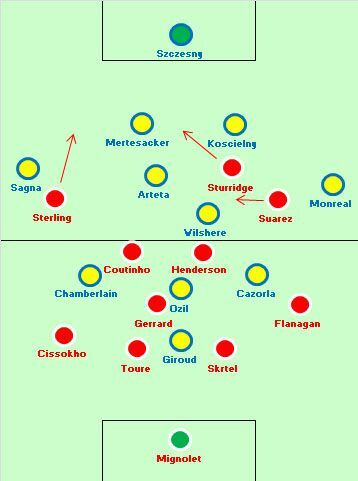 To a certain extent this is separate from the overall tactical battle, but being punished so immediately had an obvious impact upon the confidence levels of Arsenal, and put Liverpool in charge. Liverpool being ahead from the second minute meant it was impossible to analyse the sides’ starting strategies. In all probability, the game would have taken on a similar pattern – but Arsenal immediately had to chase the game, and Liverpool could afford to be reactive. Particularly impressive about Liverpool’s first-half performance was the way they continued to attack relentlessly rather than killing the game with possession dominance. This was partly due to the type of players they used in midfield – with Steven Gerrard knocking diagonals to the flanks, Coutinho supplying neat through-balls and Jordan Henderson charging forward into attack. The omission of Allen was a slight surprise given Arsenal’s midfield quality, and on another day Steven Gerrard would have been overloaded between the lines. In fact, the frantic nature of the early exchanges gave Arsenal opportunities to break themselves – in the second minute, Arsenal attacked 4 v 4 and Skrtel found himself making a last-man tackle on Giroud to prevent a one-on-one. This was arguably even more crucial than his headed opener, considering the consequences had he brought down the Frenchman. Giroud lacked the burst of speed so obvious at the other end in the coming minutes. 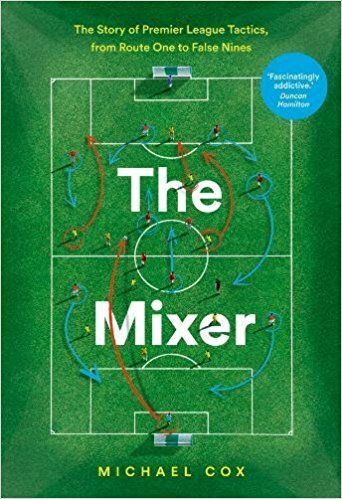 But Liverpool justified Rodgers’ brave approach with their stunning attacking play, repeatedly cutting through Arsenal, who always had too many men in advance of the ball when moves broke down – a consequence of them chasing the game from an early stage. The game state shouldn’t excuse Arsenal’s blatant errors throughout the game, particularly their sloppiness in possession. However, Liverpool can take a large amount of credit for winning the ball so regularly in midfield, because their pressing throughout the first 20 minutes was extremely intense. Henderson always seems to press effectively against Arsenal from a central position, and Coutinho continues to impress in a slightly deeper role where he’s battling as much as creating. Ozil v Gerrard would have been Rodgers’ main concern before the game, but simply by shutting him down quickly, Liverpool coped nicely. Although Liverpool’s defensive record this season isn’t particularly good, they appear to be excellent at highlighting and negating the threat of the opposition dangerman – they also did a good job on Yaya Toure earlier in the campaign, and surrounded Ozil here. 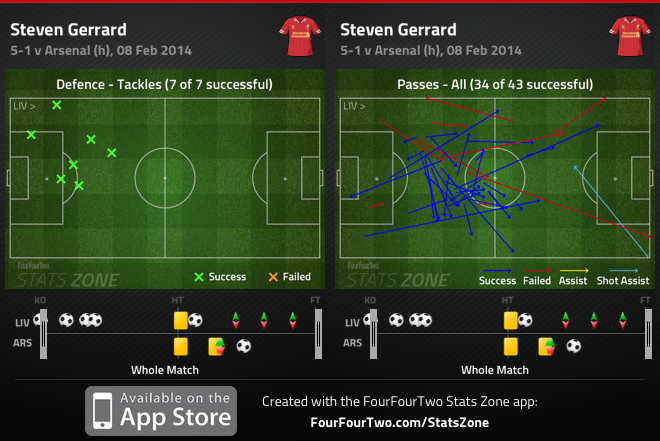 Gerrard played a more physical role than usual, notably using his strength to unsettle Arsenal’s midfield. Indeed, Ozil was dispossessed for Liverpool’s third and fourth goals (and for the move that resulted in Sturridge missing a one-on-one at 2-0) and because Arsenal’s system depends on good ball retention to get the full-backs forward and pin sides back, they were in an awful defensive position, unable to defend Liverpool’s quick breaks, and particularly vulnerable to the pace of Liverpool’s three attackers. That said, the advanced positioning of the Arsenal full-backs nearly resulted in an early equaliser, when Monreal’s run in behind resulted in a mix-up between Simon Mignolet and Jon Flanagan. Arsenal need direct running from full-back without Theo Walcott or Lukas Podolski, so it’s not unreasonable for them to play so high up the pitch. However, they probably took it too far. Liverpool used the ball extremely quickly, often looking to their right flank, because Santi Cazorla had drifted inside and created room to break into. Sturridge cut inside and shot from range, before Flanagan supported Sturridge him brilliantly on another quick attack, which led to the corner for Skrtel’s second goal. The third came from the right, too, with Suarez assisting Coutinho – both assist and shot were played first-time. The chance Sturridge missed at 2-0 was actually a better representation of Liverpool’s play than any of their goals – they won the ball quickly in midfield, Coutinho immediately chipped the ball to Suarez who touched it into the path of Sturridge. Arsenal shouldn’t have conceded possession but it’s difficult to see how they could have defended any better – Per Mertesacker wasn’t in a very good position but probably would have been outpaced anyway. Again, it was just stunning, one-touch passing football from the home side, following good midfield pressure, and the same was true of the fourth goal. Amazingly, Arsenal managed to prevent Suarez from scoring – he came closest from scorching long-range shots impossible to defend, and a little like Lionel Messi, scoreless in Barcelona’s famous 5-0 win over Real Madrid in 2010, played a backseat role as a supplier rather than a goalscorer. Sturridge and Sterling were the main attackers – Sturridge charging towards goal from an inside-left position, and Sterling always popping up on the left, at the far post, as if Arsenal given 100% of their attention to the SAS and forgotten about the third man running. His five shots were taken from absurdly close-range positions. Interestingly, Liverpool’s front three were in completely different roles from the win over Everton, even accounting for the fluidity. Sterling, for example, was on the opposite flank permanently, while Sturridge led the attack rather than Suarez. Considering all three were so effective, it’s difficult to know which zone of the pitch Rodgers was concentrating on when deciding to make this switch. Realistically the game was over by half-time, and you get the impression both managers would have shaken hands there and then – Rodgers to be assured of a huge victory, Wenger to prevent further embarrassment and to rest his players ahead of a tough few weeks. The second half was played at half-pace, with the contest long since decided. Arsenal were not good – that much is obvious. But whereas in Liverpool’s 5-0 win over Tottenham, they barely needed to play particularly well and Spurs’ strategy was so baffling it resulted in their manager being sacked the next morning, this was all about Liverpool. Some of their goals were sublime in terms of pace and precision on the break, and there were other – often better – moves that didn’t result in goals, too. There’s been a growing feeling throughout Rodgers’ 20 months in charge that Liverpool are better the more direct they’re able to play, and this was the finest example yet. Liverpool did everything quickly, from winning the ball in midfield to releasing it in behind, and produced a level of performance not seen at Anfield for some time. Good analysis as always Michael. Regarding the front three Rodgers commented after the game that Sterling was moved left to negate the attacking threat Sagna has provided this season, perhaps feeling he would be more disciplined and effective at that task than Suarez or Sturridge. Having performed poorly when trying to squeeze Coutinho, Sterling, Sturridge and Suarez into the same lineup (rarely possible due to injury or form in any case), Rodgers has to be commended for persisting and now seemingly have found a system that maximises their attacking threat whilst also maintaining enough presence in midfield for the majority of Liverpool’s games. The consistency of Flanagan and improved performances of Cissokho in recent weeks has also been of great help. Didn’t see that about Sterling, thanks Sach. Makes sense, I suppose. It seems like Arsenal lost their tactical composure after Liverpool took a 2-0 lead. i don’t know what Monreal was doing (especially on Liverpool’s 3rd goal.) Neither Arteta or Ozil seemed able to play through Liverpool’s press. - With the interlocked midfield and Liverpool pressing hard, I was suprised Arsenal didn’t try to play down the flanks through Ozil. Are Arsenal a bit tactically naive in these “big” games? They have a very good defensive record this season but my perception is that on the big occasions they struggle. Is that the result of going out with the wrong strategy? Big mistake by Arsene wenger to use monreal instead of Gibbs. And Liverpool change their tatics from 3-5-2 to 4-2-3-1. I saw the surprised look at AW face. It is an absolute failure on all fronts, from preparation to analysis to personnel to tatics. No wonder wenger blamed himself. Surprised they didn’t play 3-5-2? LFC haven’t played 3-5-2 at the start for months (maybe since the Arsenal game, come to think of it), and don’t even have 3 healthy CBs! Is it just me, or in last year and a half or so, Wenger deployed Arsenal as tight, deep 4-4-1-1 organised side against weaker teams; and than suddenly, in big games, he always chooses lush, wide 4-1-3-1-1, instead of the other way around? Especially when it’s yesterday’s news that Arsenal can’t cope with pressing from the front. You just can’t play ”nice” football with slow backline (due to Mertesacker) AND with slow front (due to absence of Walcott and semi-fit Oxlade-Chamberlain). Arsenal played Liverpool like that last season when they beat them 0-2 @ Anfield. The presence of Diaby made all the difference back then. Arsenal lacked a ball-winner with a physical presence in the center of midfield; they looked very uncomfortable without the ball and couldn’t deal with Gerrard and Henderson’s physical power when they had it. That’s where Arsenal really missed Ramsey. Wilshere was played in that role on Saturday, but as a CM he was awful – zero defensive work rate, and he gave Sagna no cover on his forward runs. 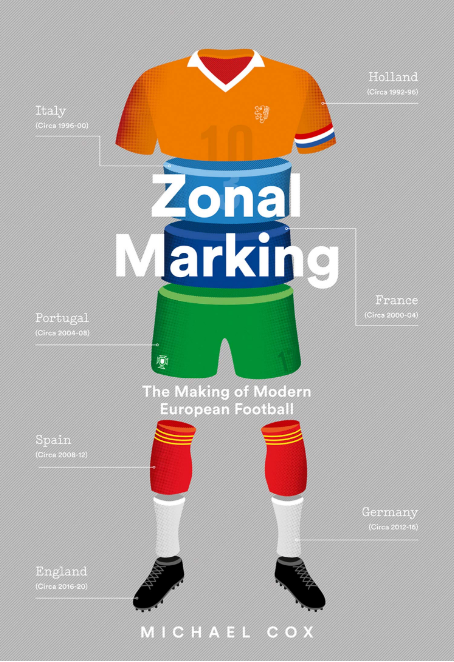 It’s not just that the EPL is more exciting this season in the sense of well contested, it’s far more exciting in terms of the quality of much of the attacking play. Last season a dull ManU won by a country mile mainly due to the remarkably effective RvP. Bale was magnificent, and that was about it. This weekend alone, my wife pointed out that during the highlights show I was yelping and applauding goals from both Liverpool and Chelsea. In earlier weeks it’s been ManC and Arsenal too. And Southampton. Liverpool’s outlets to the right also were because Suarez was playing wide, and having him wide made Arsenal pay attention, freeing up Sterling on the opposite side. Suarez is a strong team player, works very hard and supports teammates, if he remains comfortable out wide then the pitch will be very stretched and the opponents will have to focus a lot of attention out there, as he isn’t just a danger to cross or pass in (listening ManU?) but can carry the ball in on his own for shots. Would you say that there was a clear difference in how the Arsenal team set up in comparison to the one we saw in the home game against Liverpool? The way I saw it – Arsenal played with a defensive line that was much higher up the pitch with both fullbacks high up the pitch at Anfield. As opposed to the much more narrow and deeper approach in the home game. Is there any chance Arsenal will not get slaughtered against Bayern? I hope unlike the previous tie, Bayern will not score with the first attempt like they always do and Arsenal will have at least some time to keep the game even, but i m wondering which approach Wenger will choose. Against Barcelona in 2010 and 2011 it was a very frantic beginning with both teams pushing up and pressing high, but I don t think Wenger will take this route. Maybe he accepts the midfield and ball retention superiority of Bayern and lets his boys sitting deep. I think if Arsenal can keep a clean sheet for a while it might be possible to catch Bayern on the counter, cause like Barca, their fullbacks are pushing high and they leave the flanks open some times. Boateng is a weakness when facing one on ones on the break. Hence I predict Bayern winning by 1 or 2 again.